Have you yet tried ruby chocolate? It’s my newest obsession as I only just got my hands on this newest chocolate variety introduced in 2017 by Barry Callebaut, a Belgian-Swiss cocoa company. Not only does it have a natural pinkish colour but the taste is very unique, having hardly any taste of traditional cocoa flavour. I’m hardly an expert as I’ve only experienced it in a few recipes so far but interesting facts can be found on it’s wikipedia page. 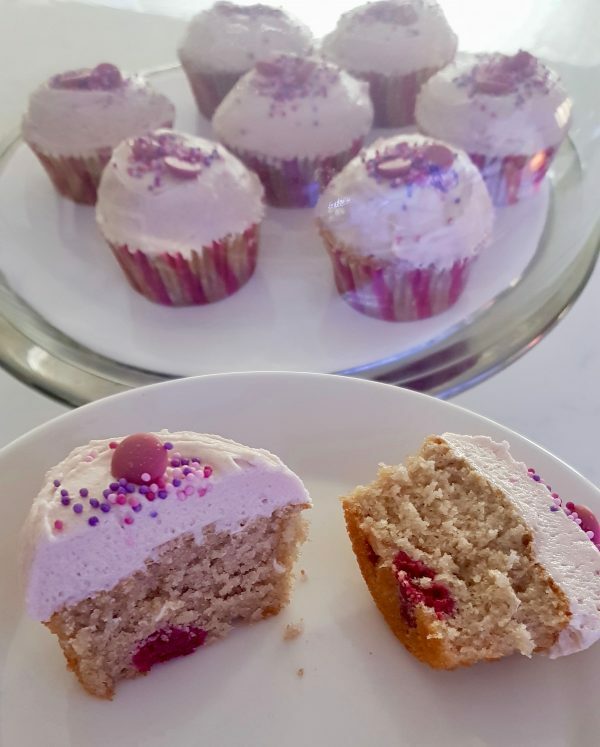 For me it felt natural to test it on cupcakes, so here’s how my first trial turned out! 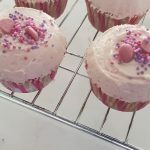 I am pretty stoked about the shade of pink it maintained in the icing as I had anticipated that it would fade and require assistance of a drop of food colouring. 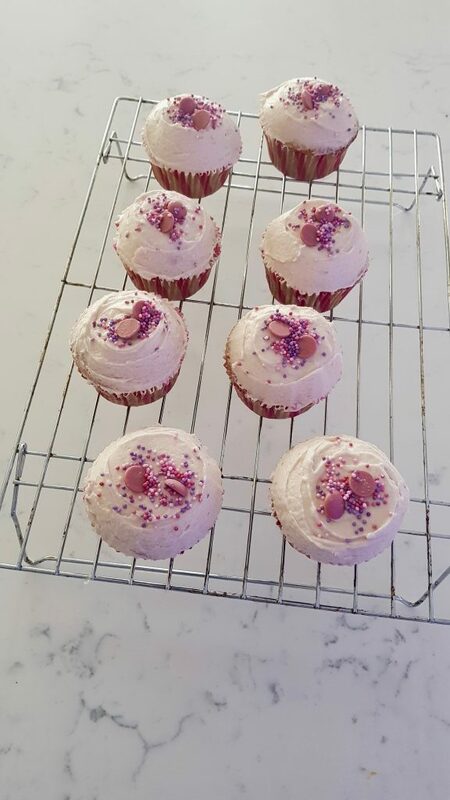 I felt nostalgic working the icing with paletta knife instead of piping and in lack of fresh raspberries, that aren’t in season in here right now, sprinkled some pink and purple nonpareils on top. 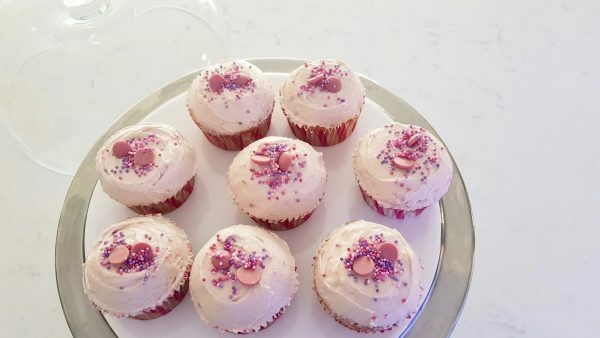 Preheat oven to 170°C and line a cupcake tray with cupcake cases. Place sugar and butter in mixing bowl and beat for few minutes until incorporated then add the egg. Add melted chocolate and continue beating for about 2 minutes. In a separate bowl mix all dry ingredients, place milk in a glass and add vanilla. Add both dry ingredients and the milk into the main mixture in two goes and keep beating, until incorporated and smooth. Mix the frozen raspberries with a spoonful of flour and fold in by using a spatula. Spoon into cupcake cases filling ¾ full. Bake in the preheated oven for 20 minutes, then leave to cool down on a wire rack. Prepare buttercream icing in a mixing bow, start by preparing a vanilla buttercream then add the melted chocolate mixed with a spoonful of cream to prevent it from hardening when touching the cold icing. If too stiff add a little more cream until desired consistency. Decorate cooled cupcakes with icing and topping of your choice. Fresh or freeze dried raspberries will make a elegant and pretty topping. Sprinkles and chocolate callets work as cute topping.